La compañía danesa Athena Investments ha emitido un comunicado en el que da a conocer el resultado del laudo del arbitraje de inversiones que mantenía con España desde 2015 ante un tribunal del Instituto de Arbitraje de la Cámara de Comercio de Estocolmo (SCC) que le favorece con una indemnización de 11 millones de euros. Free trade agreements on farm products benefits primarily transnational corporations and furthers the industrialisation of agriculture. All at the expense of local food production. 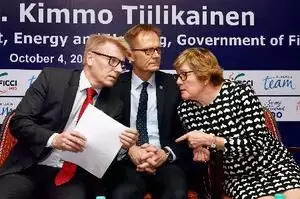 The five Nordic countries of Denmark, Norway, Finland, Iceland and Sweden have pitched for a Free Trade Agreement (FTA) with India to increase business ties. The EU meat industry is quite pleased with the agreement in principle between EU and Japan, on the basis of the preliminary outcomes for beef and pork. A considerable majority in Parliament has approved the ratification of the EU’s free trade agreement with Canada (CETA). As a result, Denmark is among the first EU nations to sign on. The Danish parliament unanimously passed a motion on Western Sahara that urges Danish companies and the Danish public sector not to trade with Africa’s last colony. Danish companies — such as pharmaceutical giant Novo-Nordisk, who will get expanded patent protection in Canada — see huge opportunities for boosting their revenues through CETA. Prime Minister Shinzo Abe and his Danish counterpart Helle Thorning-Schmidt agreed Tuesday to strengthen bilateral cooperation on maritime security and pledged to seek the early conclusion of a free trade agreement between Japan and the European Union. The judgement by the Supreme Court this week dismissing a Danish land suit against the government has shown that any foreign investment in land will not be protected by the law, defence lawyer Advocate Lewis Uriri has said. A new trade policy strategy from the Government of Denmark aims at supporting ambitious EU bilateral and regional free trade and investment agreements — especially with new growth markets in Asia. In an effort to put last year’s cartoon controversy behind them, Indonesia and Denmark have reached an agreement on investment promotion and protection.